Harbert Center(JM) CEO Jeffrey Bernstein held a special press conference prior to the taping of Ruben Studdards debut video single to announce that Wall Street Deli will introduce a new sandwich to honor our hometown hero. "We start with two slices of thick, black rye bread; pile it with a mountain of smooth, velvety corned beef, top it with creamy swiss cheese, add some tangy sauerkraut and some thick, chunky Thousand Island Dressing to create a unique sandwich sensation that reflects all of [Rubens] fine qualities." 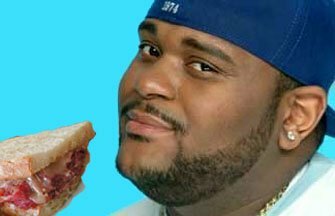 After his first taste of the sandwich, to be called 'The Ruben', the reigning American Idol, nattily dressed in gear from his upcoming 'big & tall' clothing line enthused, "Now this is a flavor thats indicative of what I am about!" The 'Ruben' will be available at all Wall Street Deli locations in Alabama. Civil Rights District(KW) As he stood in Hueytown last month renowned civil right activist Jesse Jackson saw scores of mansions overlooking tobacco fields and cattle pastures. It was then that Jackson began to realize that this illegal wealth, most of it from NASCAR, was at the heart of what ails our country. During his tour of the Magic City, Jackson campaigned to ensure that the most qualified African American candidate was picked to head the football program at UA. Although he failed, Jackson discovered an even greater evil - the absolute lack of African American representation in the world of stock car racing. Shocked to learn that there was still a sport in which African Americans had shown no interest, Jackson sprang to action. "We must strive together to prevent this tragic loss of young talent. Generations of Black men have grown up deprived of the ability to strip the wheels off of cars or drive a gaudily decorated vehicle at high speed. As such, they have been forced to turn to crime. In fact, I can think of no greater threat to the African American family today than that of NASCAR. The elitist NASCAR establishment forces our sons to participate in sports that pay much less such as football, basketball, baseball and golf." In order to remedy the perceived problem, Jacksons Rainbow Coalition has launched a new aid program aimed at leveling the playing field. The program, Heroes Overcoming Odds Participate To Insure Equality or 'HOOPTIE', will teach young African Americans the skills they need to compete on an equal footing with their more privileged white counterparts. Midnight NASCAR events will be held in black neighborhoods where kids can practice taking the wheels off of actual race cars, and see the effects of fins and scoops in an actual wind tunnel. Jackson hopes to secure ten million dollars in federal funding in addition to the one hundred thousand dollars he has already received from NASCAR. Several potential sponsors have expressed an interest in the program including Kool, Colt 45 and Ieshas House of Hair. While not actually in favor of the program, racing heartthrob Dale Earnhardt Jr. denies any knowledge of racism. "I dont know what all this prejudice stuff is about. If we were gonna exclude anybody it would be Jeff Gordon." Birmingham(JM) The Birminghamster (news - web sites) is pleased to announce that Howell Raines, Pulitzer Prize winner and former Executive Editor of The New York Times will join our staff beginning with our next issue. Forced to resign from The Times after successive scandals involving the reporting ethics of Rick Bragg and Jayson Blair, Raines is eager to start working for a publication with no journalistic ethics whatsoever. "Itll be good to get my hands dirty again," said Raines, pulling a framed photo of Paul Bryant out of a box on his desk, "the Steeldogs beat is the perfect arena for a fresh start." Birminghamster editor Marv Abercrombie, known for his dictatorial management style and 'star system' for promoting favored reporters said that he hopes Raines can be a team player and help fill the void in stories that dont involve Alabamas football coaches. Birmingham() Possibly due to the number of Greek families in the area or perhaps just because of the Magic City's desire to meet, greet, see, and be seen, Birmingham has been found by Bon Appetite magazine to have the highest per capita lunch crowd in the U.S. One of only two cities to have busier lunchtime traffic than morning rush hour - the other being Jackson, MS - Birmingham's restaurants excel at getting people in and out while providing some of the best meat and three in the nation. "People come from neighboring states to eat lunch here," said Doris Kline of the Birmingham Convention and Visitors Bureau. "There are more out of state car tags at Nikki's on a daily basis than at both Visionland parks combined." The magazine described Birmingham's climate as "perfect for lunching," and noted the large number of long established lunch spots in the metro area. "We've been in business since the depression," said Jeff Costakis of The Bright Star in Bessemer. "People get these legends built up in their minds about a certain restaurant, and there's little we can do to dissuade them at that point."